Sakhan Dosova broke her hip in a fall last month and never recovered. She had been given the flat by officials in Kazakhstan who were embarrassed she was living in overcrowded conditions with her impoverished family. Her age came to light after a census in the city of Karaganda. Demographers also found she was on Stalin's first census of the region in 1926, with her age given as 47. 'She broke her hip in the fall and never recovered,' said a neighbour. 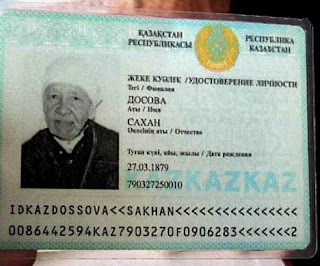 The woman's date of birth was officially registered as 27 March 1879, and was shown on her documents including her Soviet era passport and independent Kazakhstan identity card. In an interview in March, she said: 'I don't have any special secret. I've never taken pills and if I was ill, I used grannies' remedies to cure me. I have never eaten sweets. Once she was discovered, local officials rushed to congratulate her and provide her with new housing and gifts. The mayor of Karaganda, Islam Togaybayev, went to visit her 'to personally congratulate her on such an achievement and show his respect', said his spokesman. Some experts doubted her age, and claimed that while she was clearly very old, she may have exaggerated her years in Soviet times to claim special benefits. But local demographers insisted there was sound documentary evidence of her age. She outlived all but three of her children. If her age was correct, it meant she was was born when Queen Victoria still had 22 more years to rule in Britain and Disraeli was prime minister. It was the year that Stalin and Einstein were born, the Anglo-Zulu war started, and Sir Arthur Conan Doyle published his first story. The year 1879 also saw Edison present his new invention - the light bulb - while the ill-fated last tsar of Russia was just 11 years old. According to one account of her life, twice married Sarkan was widowed at the Battle of Stalingrad during the Second World War. Only three of her children remain alive. Dosova's claim came too late to be confirmed to the satisfaction of international bodies measuring world records. Officially, the oldest living person in the world is American Edna Parker of the US at 114 years-old.